America, meet Tim Tam! Go anywhere in Australia and you’ll feel it. That deep, raw, unbridled passion Aussies have for their Tim Tam® biscuits. That kind of love is hard to understand. Until of course, you try one. Don’t be fooled by its chocolaty, creamy, crunchy appearance though; Tim Tam® is no cookie! Made by Pepperidge Farm. When Australia’s favorite biscuit (not a cookie) finally debuted in the United States, WebDevStudios was hired to build the website for this historic product launch. ItsNotACookie.com went live in January 2017, introducing the country to a new tasty treat and allowing us to build something sweet for the web. When designed properly, motion graphics and animations can captivate website visitors without disrupting the brand’s message. With the crack of a tempting biscuit and the drop of some decadent crumbs, we are able to convey the indulgent delight that makes up a Tim Tam biscuit. The client provided the animations based on videos produced in Adobe Premiere and After Affects. We then translated the motion graphics into CSS animations to replicate the videos provided. It was a rather complex challenge because there were tiny pieces that all moved depending on where and when a user was on the page and the direction they were scrolling in, as well. The experience is completely personalized for the individual visitor. Tim Tam is spreading deliciousness everywhere, and that includes Twitter, Facebook, and Instagram. Integrating branded social media into a website is an important avenue for digital marketing because it shows website visitors which channels the brand can be found and encourages new likes and followers. 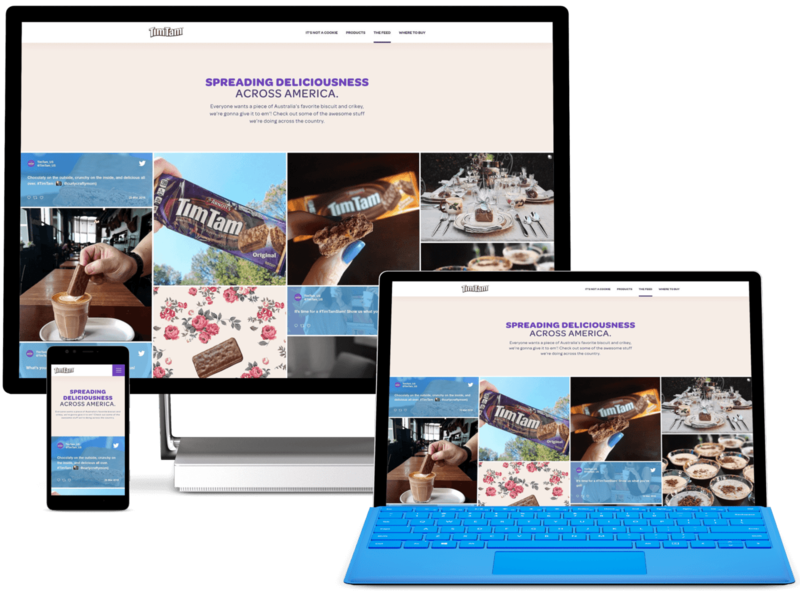 Utilizing the services of the third-party application, Jucier.io, we designed and developed The Feed page, giving Tim Tam the control to show off its tastiest social media shares all on one page. Conversion is key to profit. The customized product locator we created for Tim Tam empowers website visitors to become consumers. With its own dedicated space, the Where to Buy landing page allows dessert devotees to search for their favorite Tim Tam flavors and be directed to the appropriate online shops and nearby grocers with those specified products in stock and available for purchase. Now, Tim Tam fans will always know where to go to get their biscuit fix.